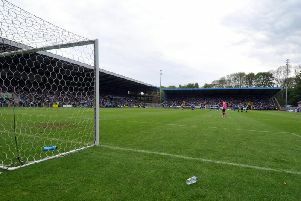 Halifax’s The Shay stadium is getting on-side with dementia in a bid to better connect older people. In support of the mission to make Calderdale Dementia Friendly, business and voluntary sectors are pulling together to improve the lives of local people living with the illness which affects 850,000 people in the UK. This figure is expected to increase to one million people living with dementia in 2025. Currently there is no treatment to slow the progression of the neurodengenerative disease. Sowerby Bridge property developer MBi, The Shay and Alzheimer’s Society are working together to introduce and oversee Touchline Tea Stop - a dementia friendly cafe at The Shay. On April 23, Touchline Tea Stop will officially open and welcomes anyone whose life is affected by dementia to chat over a ‘cuppa and some cake’. The cafe will be run by volunteers from each of the organisations including MBi which specalises in building dementia-specific care homes, and visitors can get better connected with people who understand their situation. Servings of support will be on the menu of at the monthly dementia friendly cafe which will hold activities including the playing and showing of video and photo archives, music and more. As part of the #MakeItStop Courier campaign Touchline Tea Stop is holding a ‘Let’s Tackle Dementia Together’ campaign - calling on Calderdale companies to show their support by donating a mug with their company logo on to the Shay stadium cafe. Businesses who wish to show their support are asked to contact cafe co-ordinator Natalie Rees on 01422 835179 and don’t forget to tweet your donated mug to #giveusyourmug. The café will run on the fourth Thursday of every month from 10am-12.30pm at the Shay Stadium, and welcomes support from local businesses and individuals of every level, whether through volunteering, offering a skill or by donating materials.